The priory’s treasure is its windows. It has the largest collection of fifteenth century glass in England which means that the parliamentarians didn’t get there during the English Civil War. It also means that although the parishioners of Great Malvern were able to buy the priory for £20 they were unable to remove the coloured glass and replace it with plain Protestant panes in later years. I was told that the glazing of the East Window began in 1430 and although the pieces of glass no longer tell a story because of the impact of time and ivy the panes are still medieval having been moved around from other locations within the church. Wells suggests that the window was originally given by Richard Beauchamp, earl of Warwick and his wife Isabel Despenser because of the roses and circle stars that appear there and which also feature on their coat of arms. Looking to the west, the arms of Richard III, then Duke of Gloucester can be found. This was probably moved from the West Window which was originally donated by him and his wife Anne Neville. Her coat of arms can be found in the western choir aisle in the so-called museum window which is largely plain with sections of medieval glass being inset there. The heads of two bear supporters – referencing the bear and ragged staff can be seen. The West Window told of the Day of Judgement. Depending upon your viewpoint of Richard III there may well be some irony in his donation and the fact that of all the windows this was the one which survived least well into the modern era. The west window of the transept is known as the Magnificat Window and was donated by Henry VII. I shall do a separate post on that as it contains images of Henry, Prince Arthur and some of his leading henchmen. However, in Queen Anne’s Chapel a treat awaits. Most stained glass involves a crick in the neck but here the windows are substantially lower so the glass is much closer. The crucifixion window is Victorian but the rest of the glass is medieval. One window tells the story of the Creation, another the stories of Noah and Abraham whilst the third relates the stories of Isaac, Joseph and Moses. It is a reminder that in an age where most people lived in small dark buildings that churches were full of light and colour. It is also a reminder that the word of God came not only from the priest but from the pictures that surrounded the congregation. The tradition of donors, some of whom are pictured above, giving windows continued in Great Malvern Church through the Victorian era with Princess Charlotte, the only child of George IV who died in childbirth, donating a window amongst others. The Friends of Malvern Priory donated the Tom Denny windows which celebrate the millennium. They can be found in the north choir. Their theme is psalm 36. Denny has used the Malvern hills as part of his inspiration as well as colours which echo the medieval windows. Denny was also commissioned in Leicester for the Richard III memorial windows. Once seen, his style is instantly recognisable. Wells, Katherine. (2013). A Tour of the Stained Glass of Great Malvern Priory. The Friends of Malvern Priory. Barnard Castle, Anne Beauchamp and oriel windows. Barnard Castle was built by the Baliol family. It remained in their hands until the reign of King Edward I when it was confiscated and passed into the ownership of the Earl of Warwick. Two centuries later it was in the hands of the Neville family but the Earl of Warwick at that time- the Kingmaker- ultimately backed the wrong monarch and managed to get himself killed at the Battle of Barnet in April 1471 as was his brother John. Warwick left two daughters who became joint heiresses to the title and estates. Isabel Neville, the older daughter, was married to George, Duke of Clarence (brother of Edward IV) while her younger sister Anne had been married off to Prince Edward, son of Henry VI and Margaret of Anjou demonstrating the Kingmaker’s ability to swap the colour of the rose in his lapel at the drop of.. er…a rose. Anyway, to cut a long story short Prince Edward got himself killed scarcely a month after his father-in-law at the Battle of Tewkesbury on the 4th of May 1471. Anne was placed, by Edward IV, in the custody of her brother-in-law. George calmly tried to ensure all the titles, estates and loots ended up in his fat little paws. It arrived at the point where Anne was hidden in the kitchen as a maid of work to prevent Richard, Duke of Gloucester and George’s little brother, from finding her. If you’re a romantic Richard and Anne had liked one another since childhood when Richard was part of Warwick’s household. If you’re a pragmatist – an heiress at the altar is a bankable asset. So Richard married Anne and there followed an undignified squabble about which husband was getting what – Richard landed Barnard Castle amongst other Northern estates. After George managed to get himself drowned in a vat of Malmsey in 1478 (two years after Isobel died) the rest of the Warwick inheritance found its way into Richard’s keeping along with his small nephew Edward and niece Margaret. Tewkesbury Abbey continued to play its role in the history of the period by being the final resting place for both George and his wife, due in part to the fact that Isobel’s grandmother was the last Despenser heiress. Tewkesbury has strong links to the Despenser family. You have to feel a degree of sympathy for Warwick’s widow, Anne Beauchamp, who was actually the daughter of Richard Beauchamp, the previous Earl of Warwick and his wife Isobel Despenser. Her brother died in 1446 and her niece died in 1449 making her husband- Richard Neville- the Earl of Warwick. So, actually neither of her daughters should have inherited anything at that point because it was Anne – the widow of the Earl of Warwick- who came with the lands and titles. Not to worry, Edward IV swiftly ensured that for legal purposes poor Anne was declared legally dead allowing his brothers to divide up the Warwick estates between them despite the assortment of letters that Anne Neville nee Beauchamp wrote from Beaulieu Abbey demanding that her rights be recognised. Ultimately Anne emerged from sanctuary and was handed into the care of her son-in-law Richard – we have no idea how she felt about her daughters or indeed their respective spouses. Rous, no supporter of Richard, wrote that Anne was kept in close confinement but there is other evidence that demonstrates that the countess must have had an allowance and must have travelled around the northern estates that had once been hers. It wasn’t until 1486 that Anne had some restitution for the loss of her money and lands and that came from the Tudors. Henry VII granted her 500 marks a year and the following year Parliament gave her estates back which she promptly gifted to the king….which suggests some shady double dealing somewhere along the line or perhaps a bid to keep her grandson the young Earl of Warwick, Isabel and George’s son safe. He was after all in protective custody in The Tower at that point. Having gone all around the houses – or castles- it’s back to Barnard Castle which overlooks the Tees. Richard seems to have spent a lot of time at Barnard Castle. He also carried out renovation and extension works. His tenure is evidenced in the remnants of the great hall. 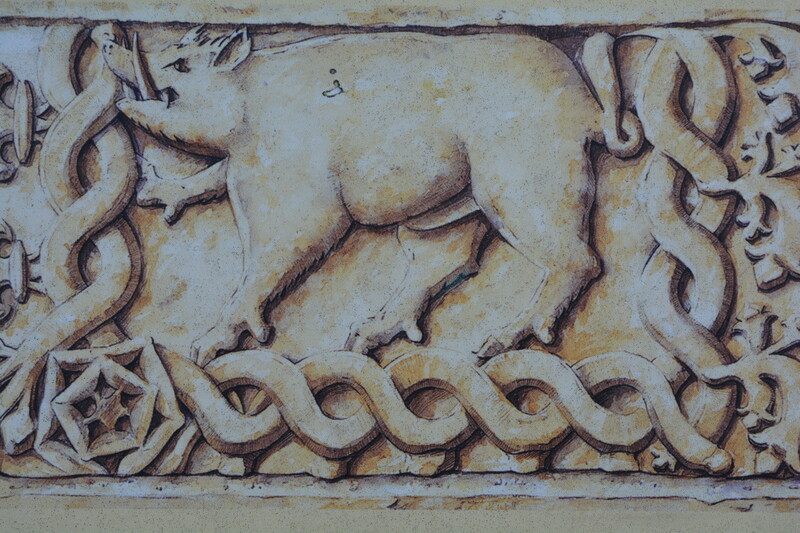 He added an oriel window – a bay window supported by corbels- on the first floor and caused a white boar to be engraved in the ceiling above it – where it can still, just about, be seen today as can an English Heritage artist’s interpretation of what it might have looked like originally.